As part of my birthday present earlier this year, my fiance got me a pad of Strathmore 12×12 watercolor paper. The paper pad comes with 12 sheets of nice, thick, cold pressed watercolor paper. Although I initially thought the paper would be great for making large watercolor pieces, the true beauty of this paper is that you can cut it down to any size you want. Lately, I’ve been really enjoying creating art to send in the mail and I thought it would be fun to try painting on some watercolor postcards. Watercolor postcards can be purchased on Amazon or at any art/craft supply store, but they can be somewhat pricey and they often come in very tiny packs. Considering that I already owned this versatile paper, I decided to cut up some watercolor postcards of my own. Since the paper is 12×12, it can be cut evenly into six 4×6 rectangles, which is within the USPS’s parameters for postcard sizes. Here’s how you can make your own watercolor postcards. Cut your watercolor paper into 4×6 rectangles using a paper trimmer or a ruler and scissors. If you are using a 12×12 sheet like I did, you will end up with 6 watercolor postcards. Once you’ve got the postcards made, you can start painting. To help inspire you, here are some of the techniques that I used on my postcards. Add depth to your mini painting by outlining the shapes with your pencil. To make the picture even more dynamic, try using a variety of lead thicknesses. For this postcard, I lined the edges of the mountains with a thick lead and then used a thinner lead for the finer details. Put watercolor paint on your brush and gently flick it with your fingers to create a splatter effect on your art piece. For this postcard, I used the splatter effect to scatter stars across the night sky. Use stamps to add a delightful design element to your postcards. For this postcard, I used a delicate butterfly stamp to compose a fun pattern. To finish off the postcard, I hit it with some paint splatter to create a more distressed look. Adding salt to a freshly painted watercolor background can add a really cool texture to your postcards. For this postcard, I painted the background blue, sprinkled a bit of sea salt on the top and then let it dry. When it was finished drying, I rubbed the salt off the paper and I ended up with a field of dandelions. If you want, you can dress up the backs of the postcards. Adding a light layer of watercolor creates a cohesive piece and stamping a few small images on the back adds some cute detail. No matter how you decorate the back, just don’t forget that the recipient’s address goes on the right under the postage stamp and your message goes on the left.To jazz up the backs of my postcards, I used a Tim Holtz postcard stamp. I had a lot of fun making these watercolor postcards and I know you will too. Give this project a try and let me see your lovely creations! Tag @annotatedaudrey on Instagram, Twitter or Facebook! 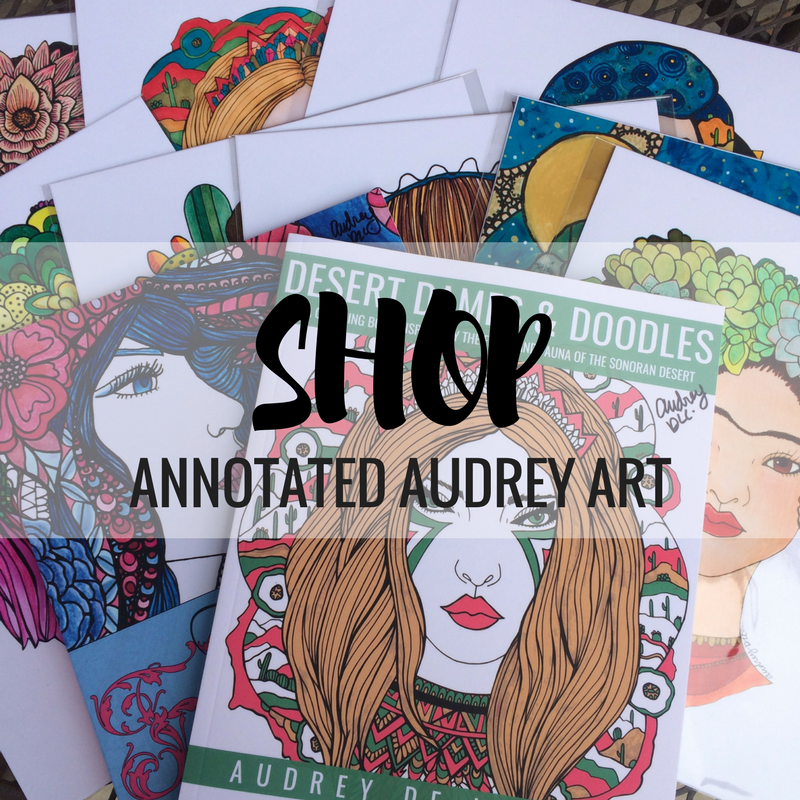 Check me out on Instagram (@annotatedaudrey) to see pictures of my latest artwork and snapshots of my life in the desert! It’s almost Mother’s Day, so I made some FREE Ecards, check them out on my Facebook Page here.